For a town of 1200, West Yellowstone is a fairly good-sized “small town”, with many hotels, restaurants, and a few tourist attractions. 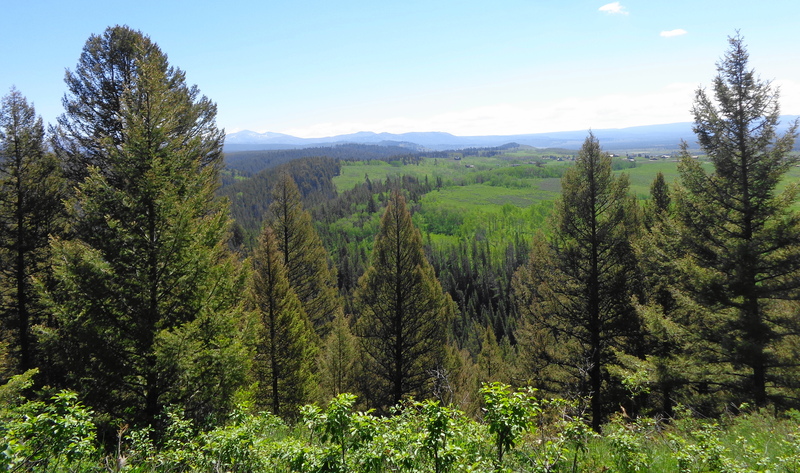 It is land locked, with the park on one side, and US Forest Service land on the other. 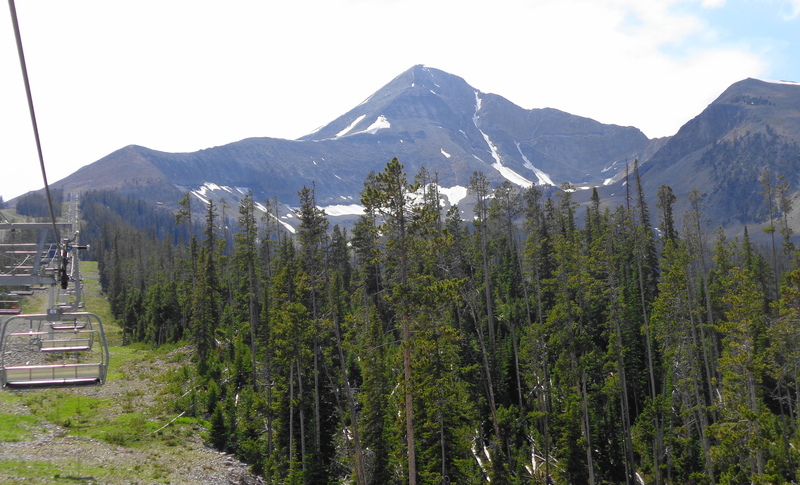 If you will be staying in this area on your visit to Yellowstone, there are a few things to see. 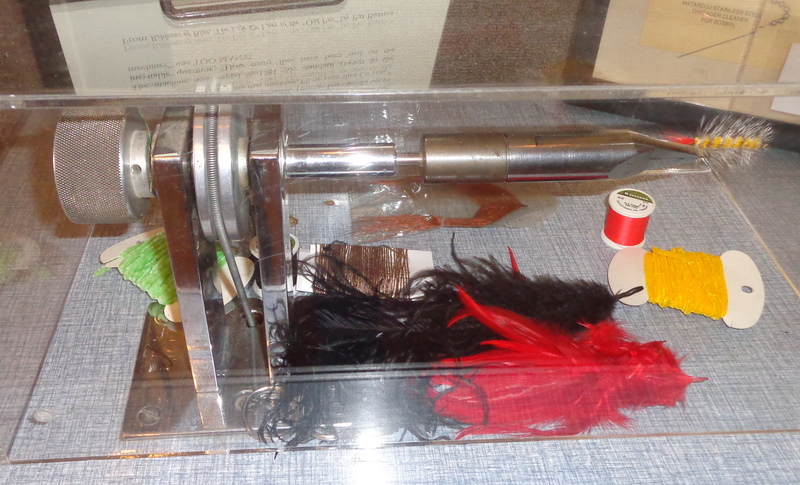 The town has a very nice museum that details the development of the region, and how tourism has grown over the years. 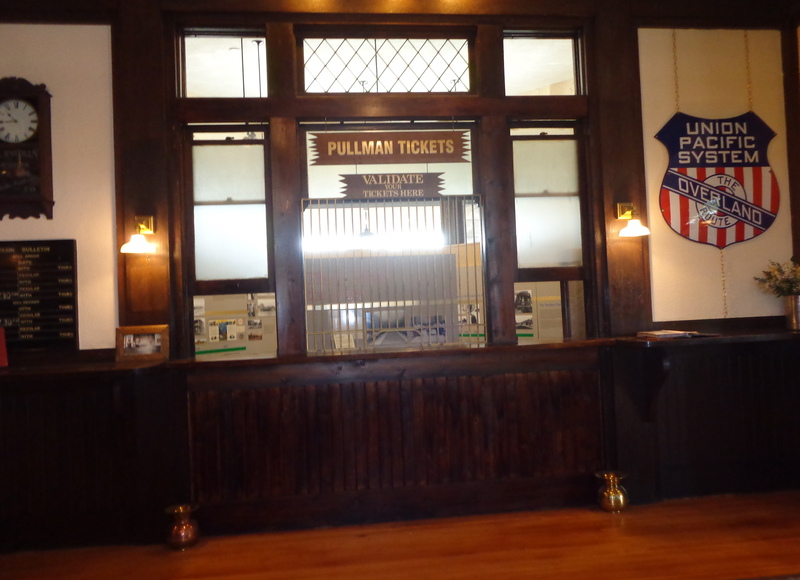 The early visitors to the park arrived by train, and the museum is housed in the historic Union Pacific train depot. 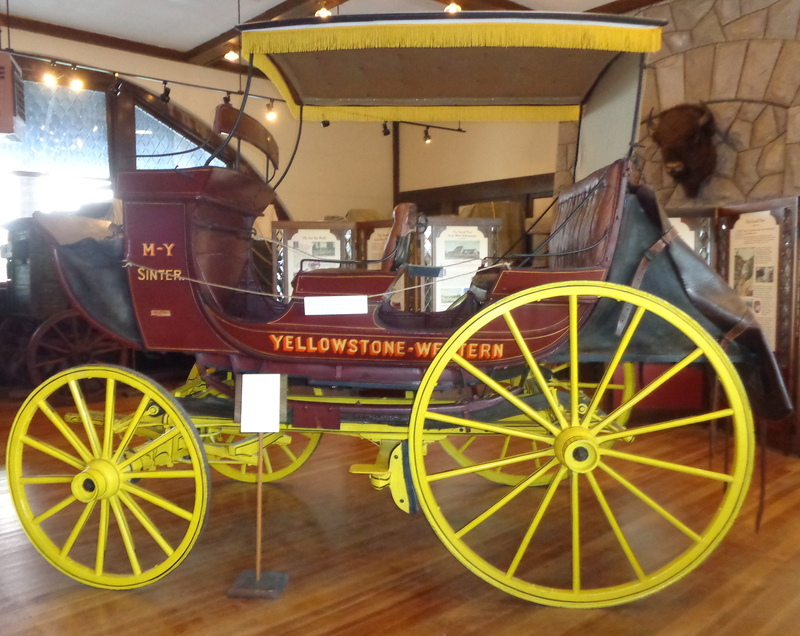 On display are several stage coaches that transported visitors into the park, as well as other historical artifacts. 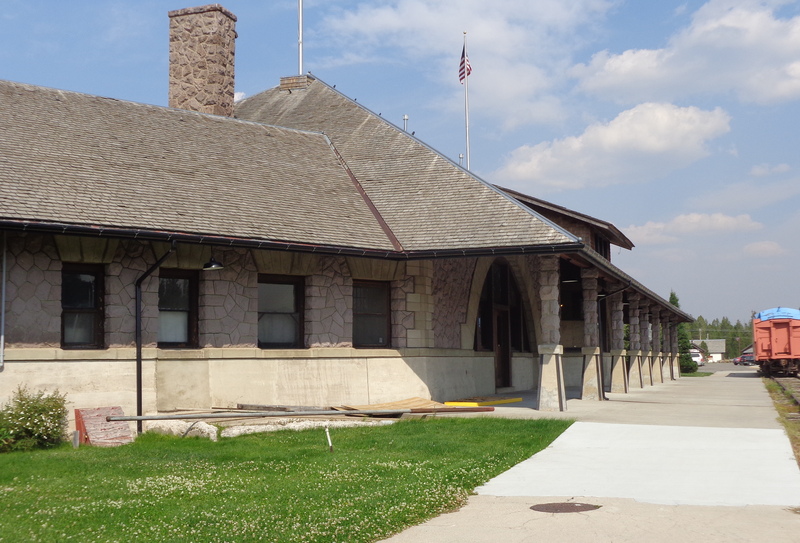 They left most of the train station in its original state. Two excellent movies are also featured, one on the impact of the 1959 Earthquake, and the other on the 1988 wildfires that burned out of control in Yellowstone. We gave both “two thumbs up”, but if you only have time for one, watch the one on the fire. That alone was worth the price of admission ($6). 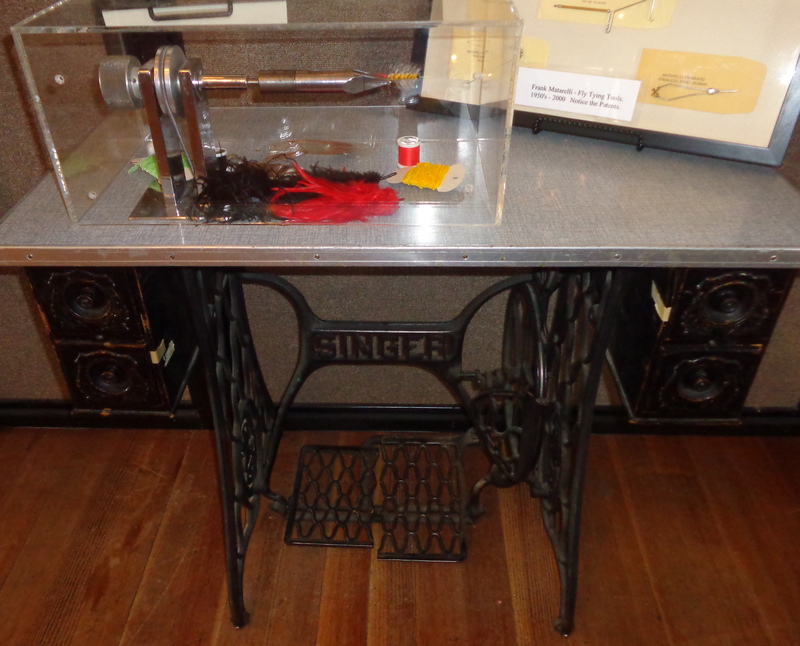 There are displays on fly fishing, including this unusual Singer sewing machine, which was turned into a machine to tie flies. 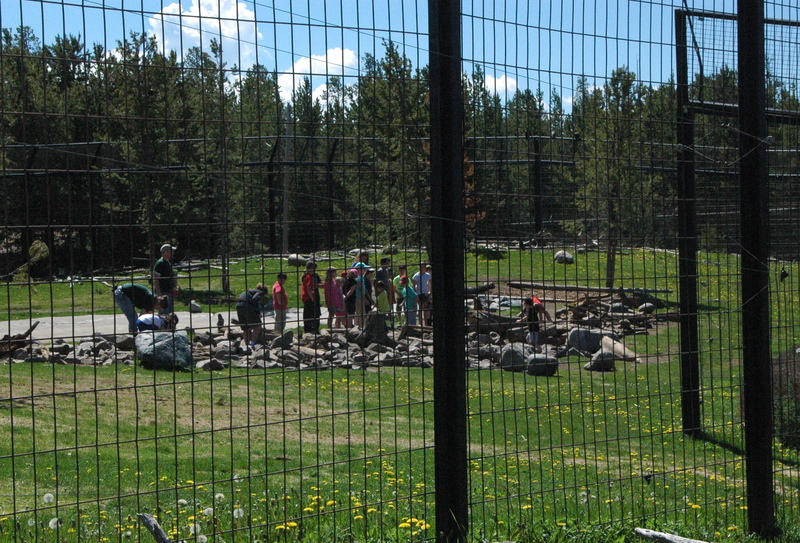 Grizzly and Wolf Discovery Center is another very popular attraction in town. It is a non-profit wildlife park featuring several wolves, bears and birds of prey that would have euthanized if not for the center taking them in. Your admission ($11) is valid for two days. The wolves are always in their habitats for viewing, and are well fed. The bears are taken in and out of the bear habitat on a rotating basis. 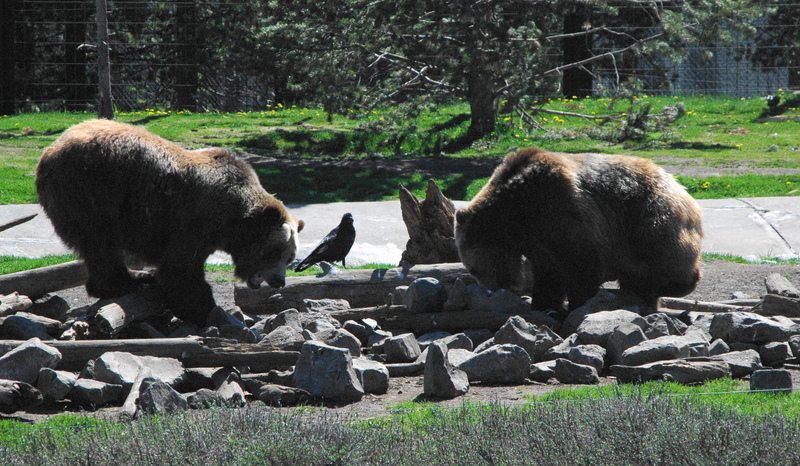 Before they switch out the bears, the staff will hide food under the rocks, and then a few bears will be let out to look for food. 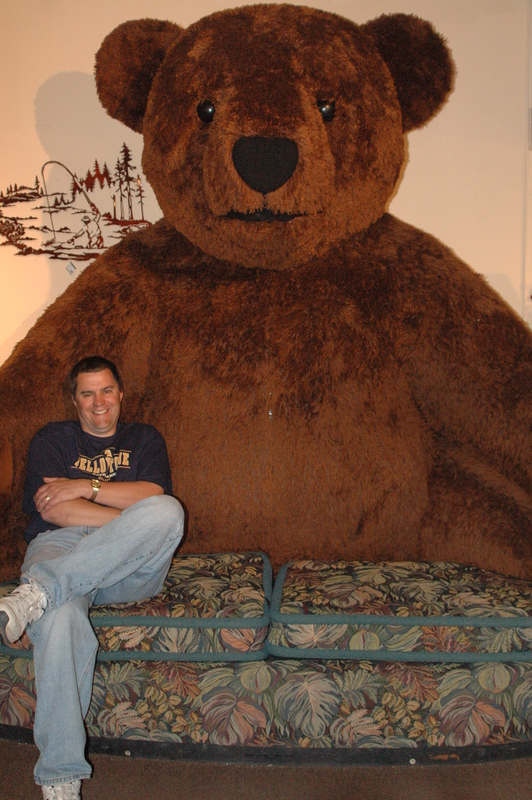 They have some nice sized grizzly bears on display. The ravens patiently wait by the bears and clean up all the scraps of food. They do have a children’s program where they let the kids come in and hide the food, which they seemed to enjoy, although some kids wanted nothing to do with touching the fish! 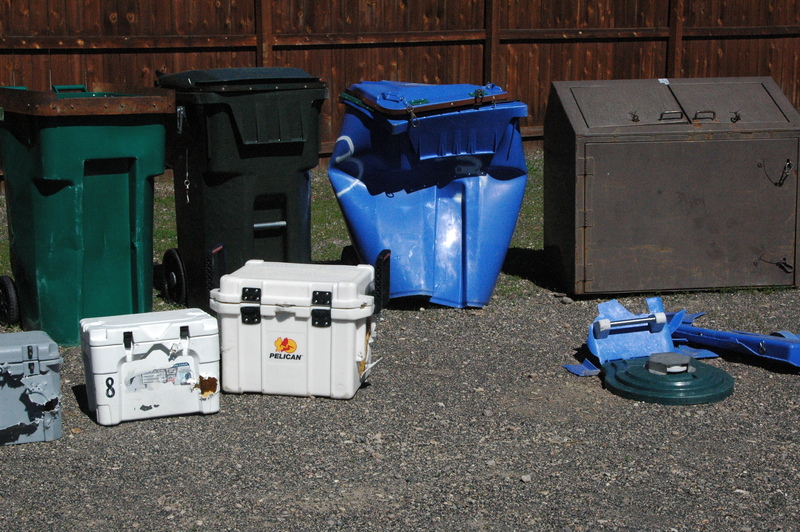 The center also tests out a lot of containers to see how “bear proof” they are, and have worked with companies to make bear proof garbage cans. Although we enjoyed our visit, we thought Bear Country USA in Rapid City was a much more enjoyable experience, as the animals are left in a more natural environment. But they did have a nice couch in their gift shop! Playmill Theater is a wonderful little theater right in downtown. This summer featured three different plays, Damn Yankees, Mary Poppins and Foreigner. 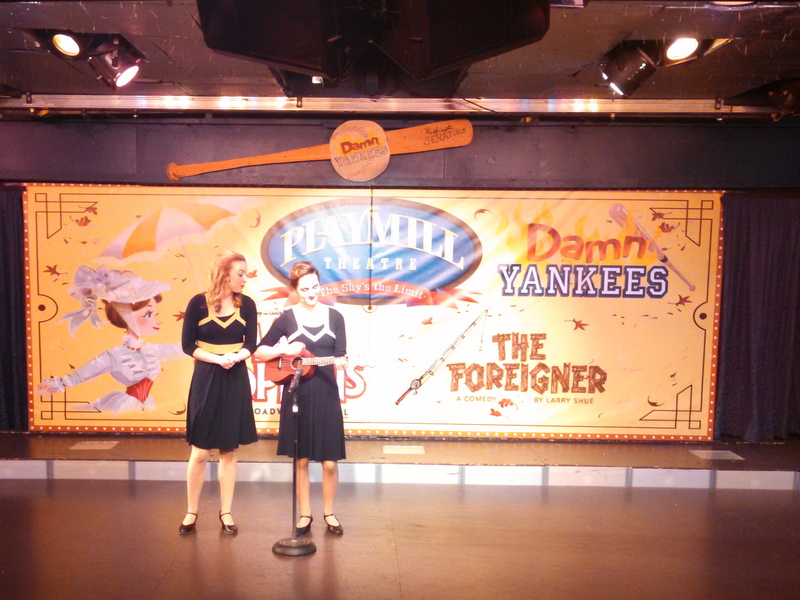 We did receive a free pass ($26/per person) and saw a great musical performance of Damn Yankees. Most of the cast is made up of college students from Idaho, Montana and Colorado. Before each show, they have a quick variety show, displaying the talents of each member. This is a photo before the play started/no photos during the play. If you have time for only one thing in town, this would be it. Make sure you book your tickets ahead of time, as the theater is very small, which assures you every seat is a good one. For those of you who like movies there is a giant screen theater in town where we were able to see a nice 45 minute documentary on the history of Yellowstone. The night of August 17, 1959 forever changed the landscape and the lives of the residents and visitors of Madison Canyon (about 10 miles northwest of West Yellowstone). Close to midnight, an earthquake, measured at 7.5 on the Richter Scale, struck this area without warning. 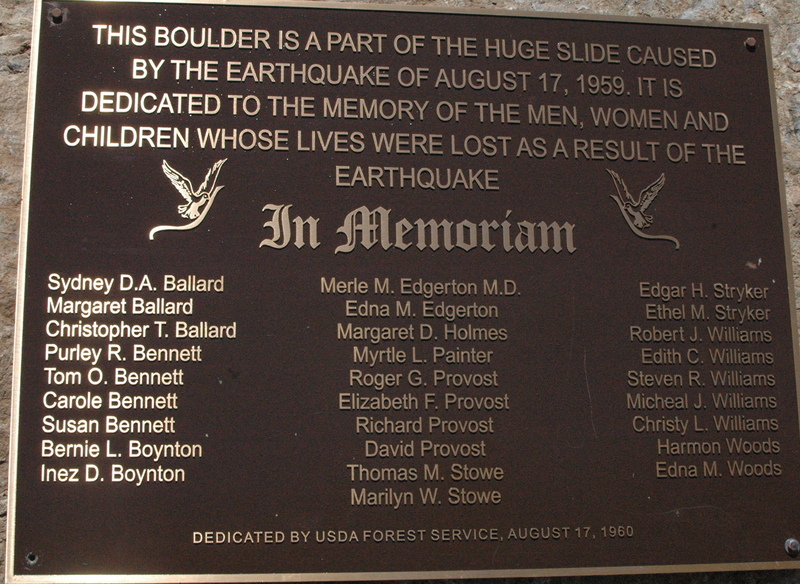 At the time, it was the 2nd largest earthquake measured in the lower 48 states. 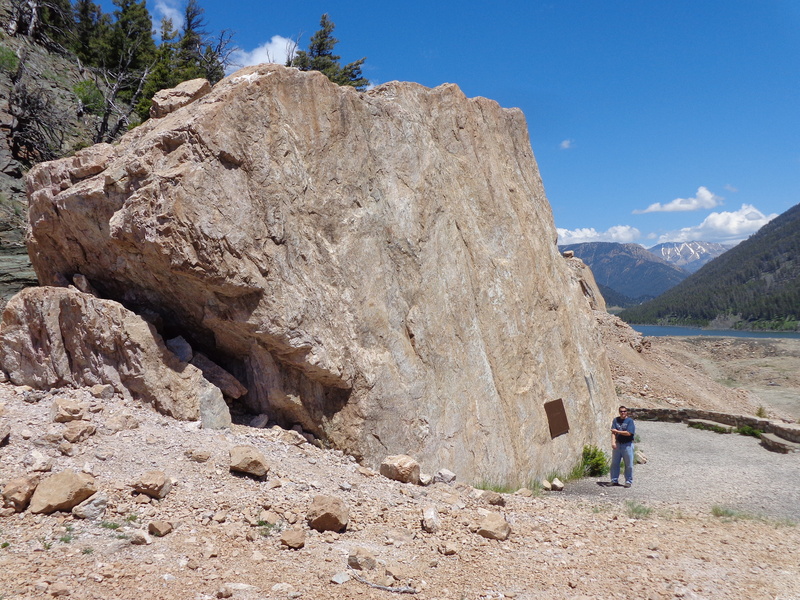 A massive landslide, over 80 million tons of rock, crashed down into the canyon and blocked off the Madison River. Many people were camping along the banks of the river in a popular campground. The landslide buried parts of the campground, and the rapidly rising waters submerged the remainder of the campground. Twenty-eight people were killed as a result of the earthquake. By dawn, a lake had formed in what was once just a river. 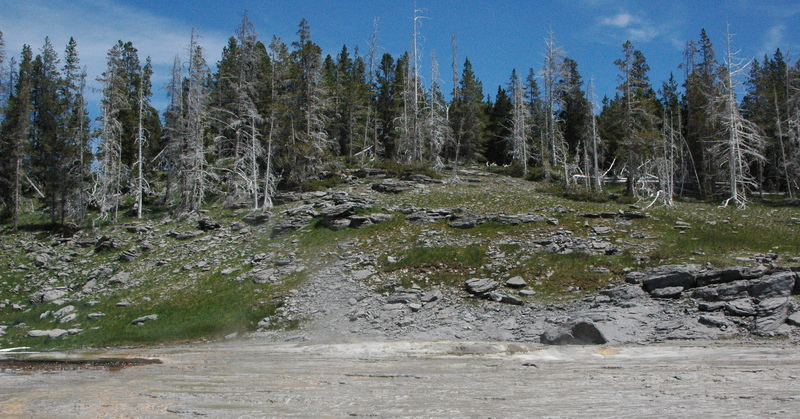 In this photo below, you can see what is now referred to as “ghost-trees”, where the campground used to be. 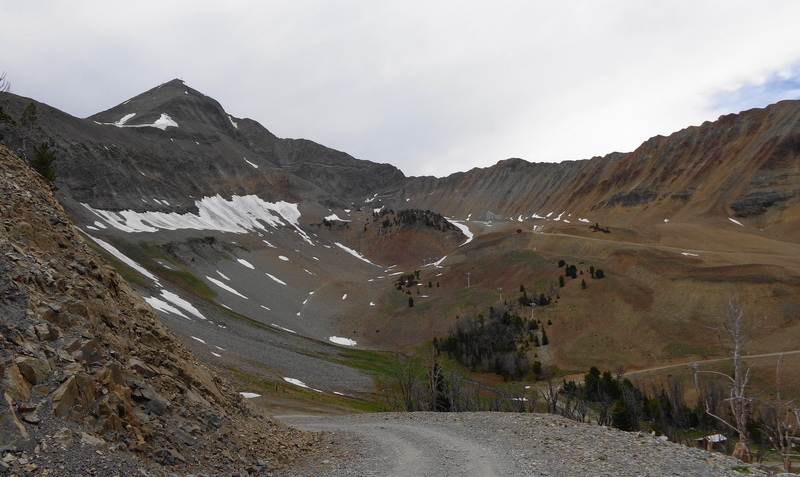 The hill where the landslide occurred is on the left side, and you can see what is called the “bathtub ring”, along the right side of the photo. This is how high the water rose after the landslide. 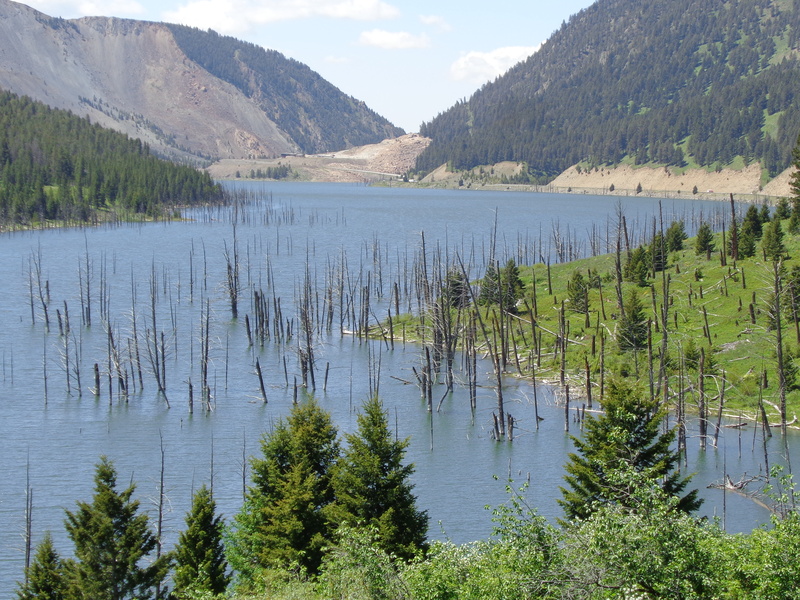 After the landslide, the water continued to rise and began rising backwards over the dam in nearby Hebgen Lake, causing several cabins to be destroyed. The water washed out many sections of Highway 287 which runs along the river. 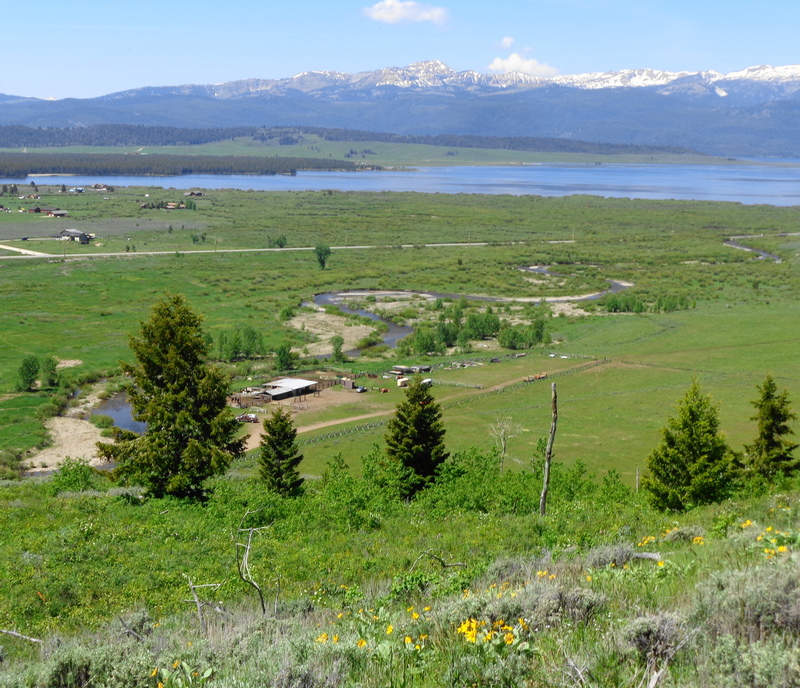 Within three weeks, what was once just a river, became a 5 mile wide, 190 foot lake. 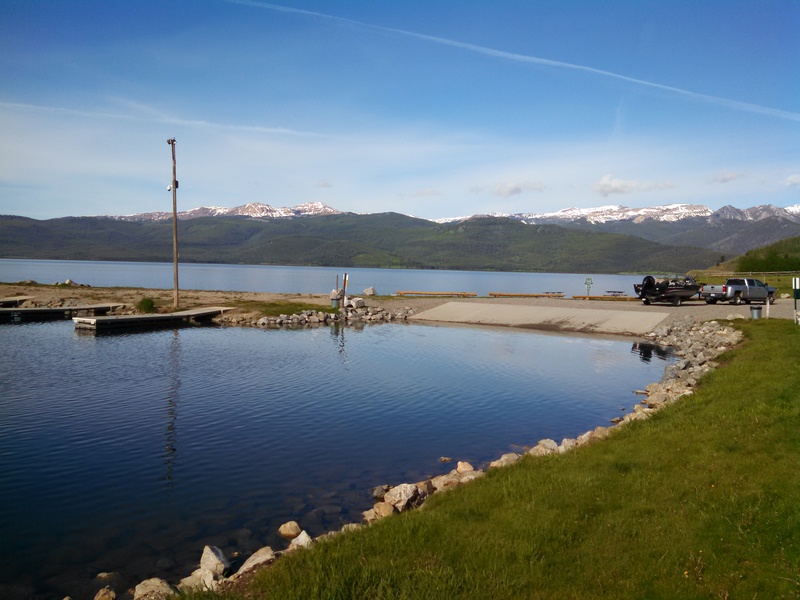 The Army Corps of Engineering was deployed and was able to blast through part of the landslide to create a spillway and relieve the pressure of the lake and control the flow of water. They were concerned if the landslide shifted, the Madison Valley area would be flooded. This photo shows the other side of the landslide, where they created a spillway to prevent the valley from flooding. Originally the spillway was a straight river, but over time, nature has taken back the landscape and created this winding river, which has become a popular trout fishing area. It is believed that the lake will continue to drain down, and eventually return to a river. But it could be decades before this happens. In the meantime, the lake is a beautiful, scenic area that covers up the scars of the past. 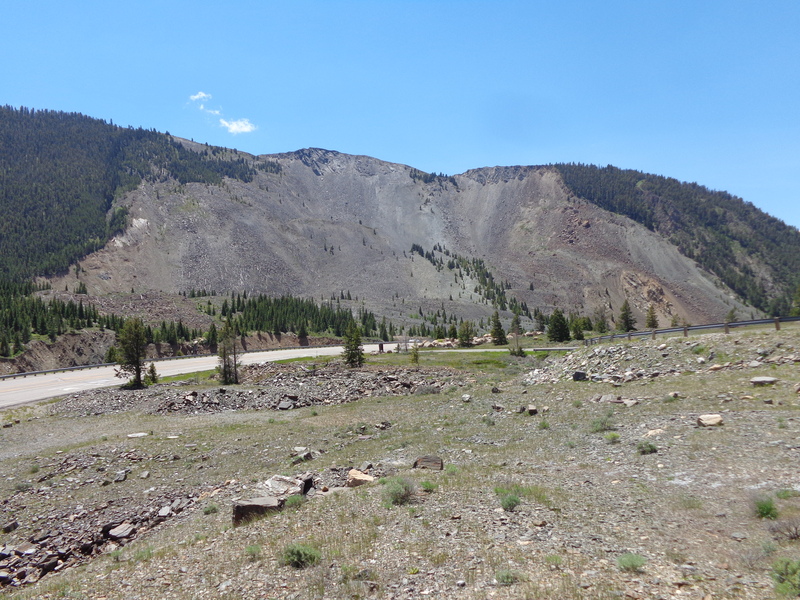 But once you turn around, the evidence of the landslide remains, with a large barren area. A portion of the rocky cliffs was sheared off, and this remaining rock has been turned into a memorial for the deceased. A plaque has been placed on the boulder with the names of those that did not survive. Over 250 people were camping in the area, so the death toll could have been much worse. 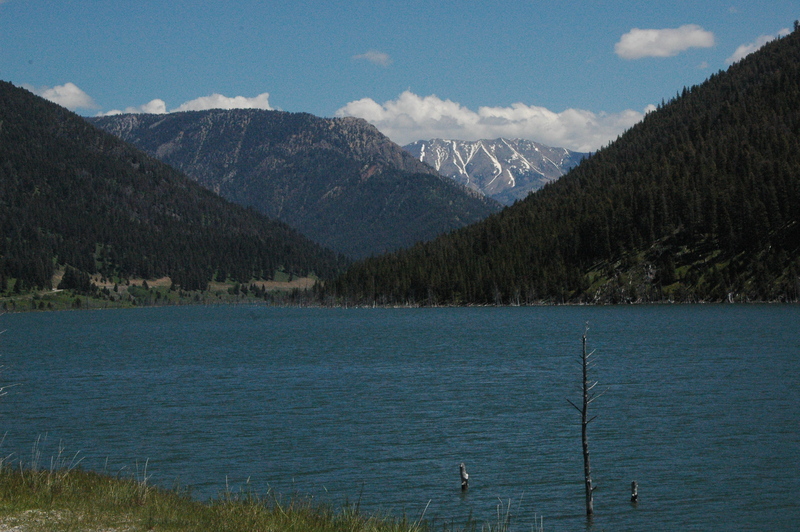 The U.S. Forest Service maintains a visitor’s center at Quake Lake. It offers an excellent video detailing the events on that fateful night, along with many photographs taken after the earthquake, and survivor’s stories. One interesting fact from this earthquake. 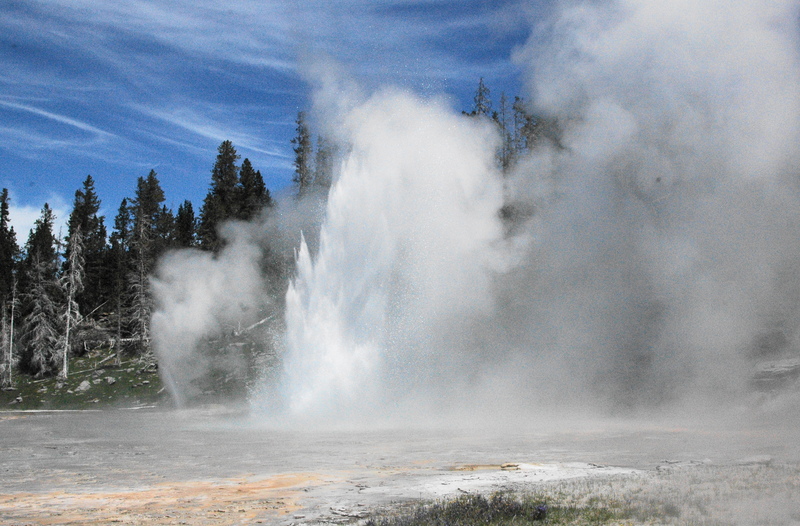 Over 200 geysers in nearby Yellowstone National Park erupted following the earthquake. If you are in the area, this is definitely worth taking a short day trip to see this area. We decided to take advantage of a few freebies with our coupon book before they expired, and headed up to Big Sky, Montana (about 40 miles north) for a full day of playing tourist. 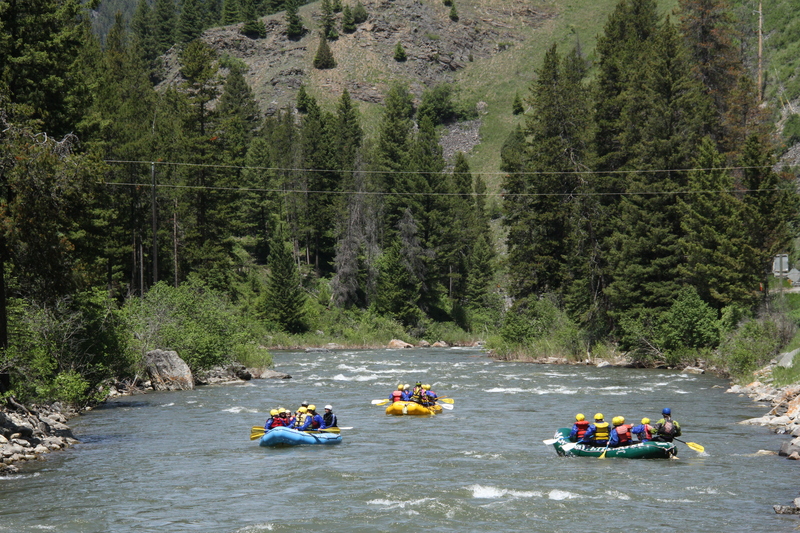 Our pass for Montana Whitewater offered two options: a zipline tour, or whitewater rafting. 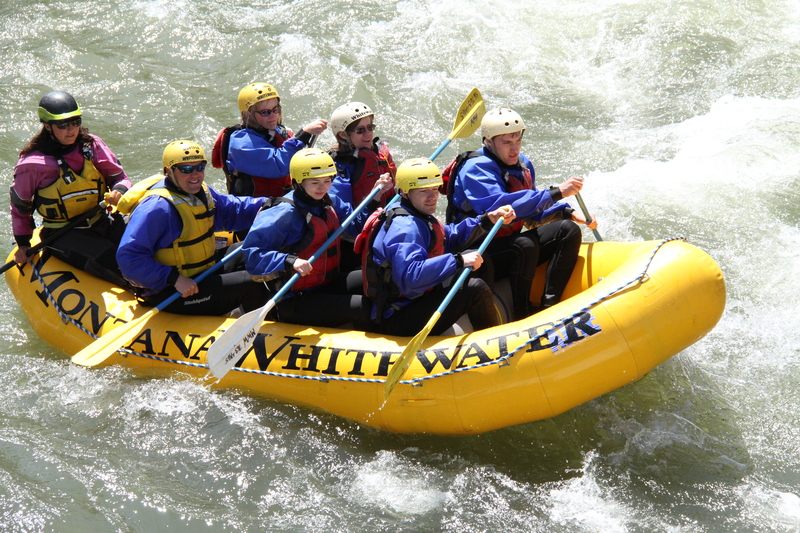 When I first mentioned to Dan that I would like to try Whitewater Rafting, he was very surprised, as I do not swim. However, I knew I would feel a lot safer in a boat, with multiple people, a helmet and life jacket than zipping over trees held on by nothing more than small cable. 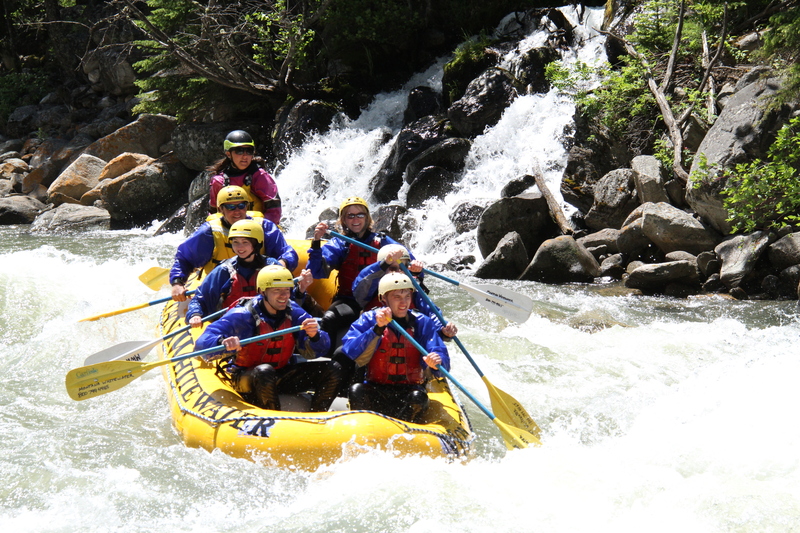 The company offers several different tours , and we opted for the less challenging 1/2 day on the Gallatin River with Class 2-3 rapids. 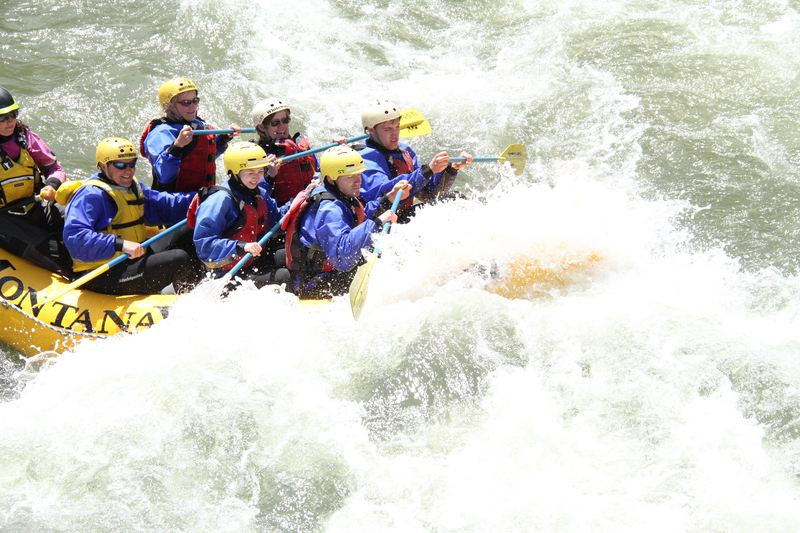 If you want to go whitewater rafter, the earlier in the season, the better the water will be, in terms of water level and speed of the water. 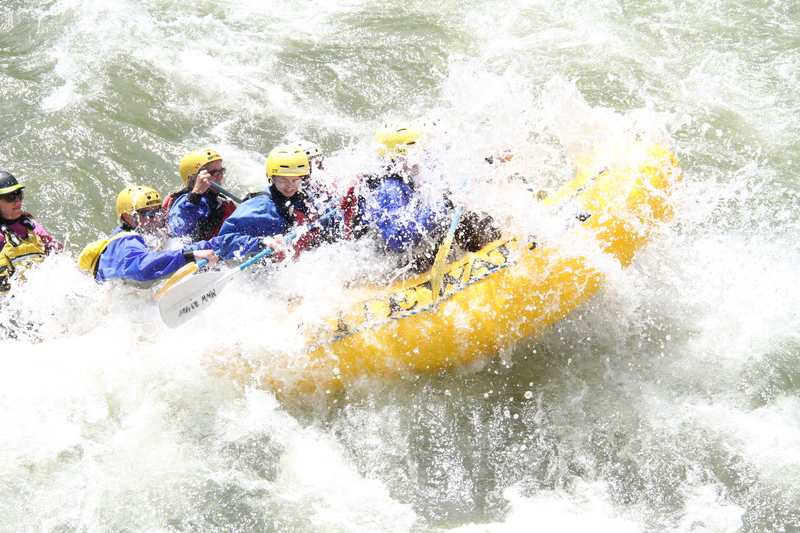 After mid-June, you will not really encounter much “rapids”, and the company will offer river tubing tours. So the earlier you can go, the more challenging it will be. Of course, the earlier you go, the colder the water temperature is! In our case, it was a brisk 40 degrees, so every splash was a bit refreshing! 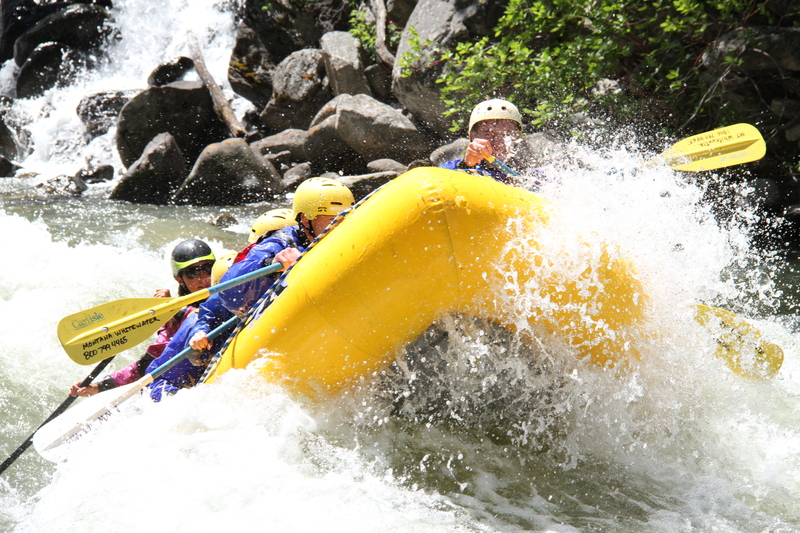 There were three rafts in our group. The guides give a lot of safety instructions, and you practice your strokes as a group. Then each raft is on its own with a guide, going down the river, for the next 90 minutes or so. We bounced off a few rocks, and our guide Nicole, informed us she is an ‘equal opportunity splasher’, and she would turn the boat in different directions so we all got wet. Fortunately, this tour company provided free wetsuits and neoprene boots, which helped, but it was still chilly. There were areas of calm water, followed by rocky, fast-moving water, which made for a fun morning. Enjoy our little sequence where we all got wet! 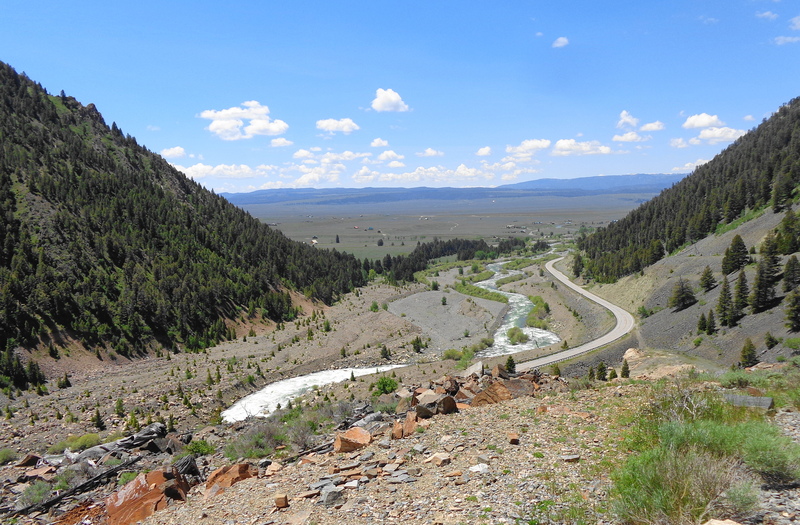 The Gallatin River runs along Highway 191, and the scenery is very beautiful. watch out for the rocks! 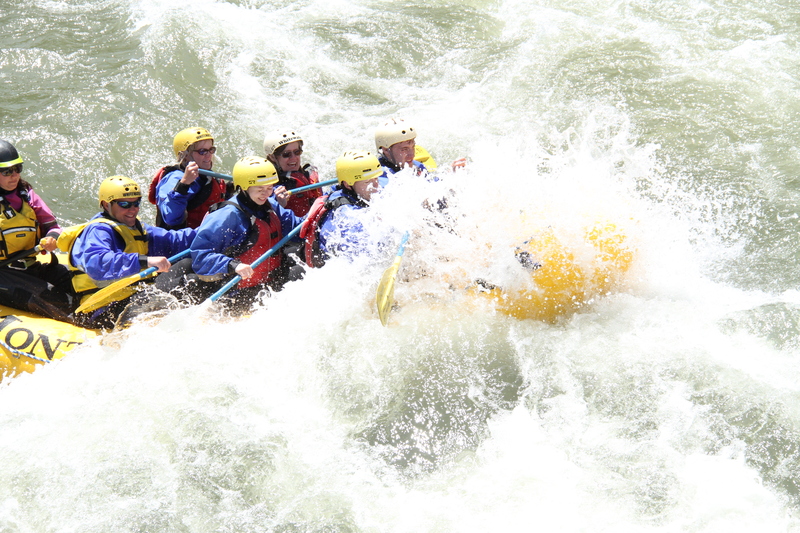 We had a great time with Montana Whitewater, and would definitely recommend this company. The cost for a 1/2 day tour is $55.00 per person, and does include wetsuits. There are other tour companies, but they charge you extra for the suits. If you go early in the year, you definitely want to have them. We had free passes, but this was definitely something we would pay for with this company. We stopped along the river for a quick picnic lunch, then headed into the city of Big Sky. On our drive in, we saw a sign for Lone Peak Brewery, so we decided to stop in and sample some of their local brews. Our 5 sampler came on a mini ski! Of the beers that we sampled, we liked two, Hippy Highway Oatmeal Stout, and a bourbon beer that was finished off for several weeks in a used bourbon barrel. Unfortunately, they do not can or bottle either of these two flavors. So if you want to try them, you will have to come to the brewery! 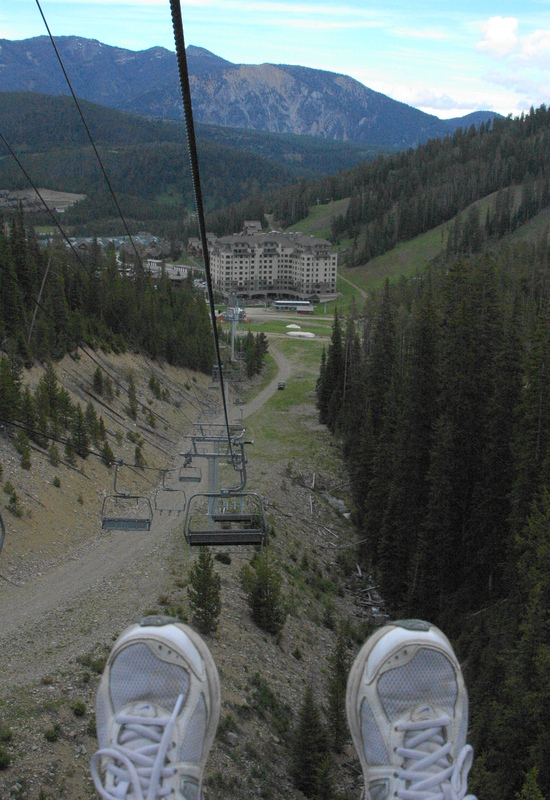 We continued on to the Big Sky Resort, for our complimentary scenic ski lift ride ($16/adults) from Mountain Village (7500 feet) to Swift Peak (8800 feet). There is an additional tram that will take you to the top of Lone Peak (11,000 feet), but we did not have time for that tour. The lift was very quiet, and took about 15 minutes to get to the top. I found that staring at my feet helped with the heights! 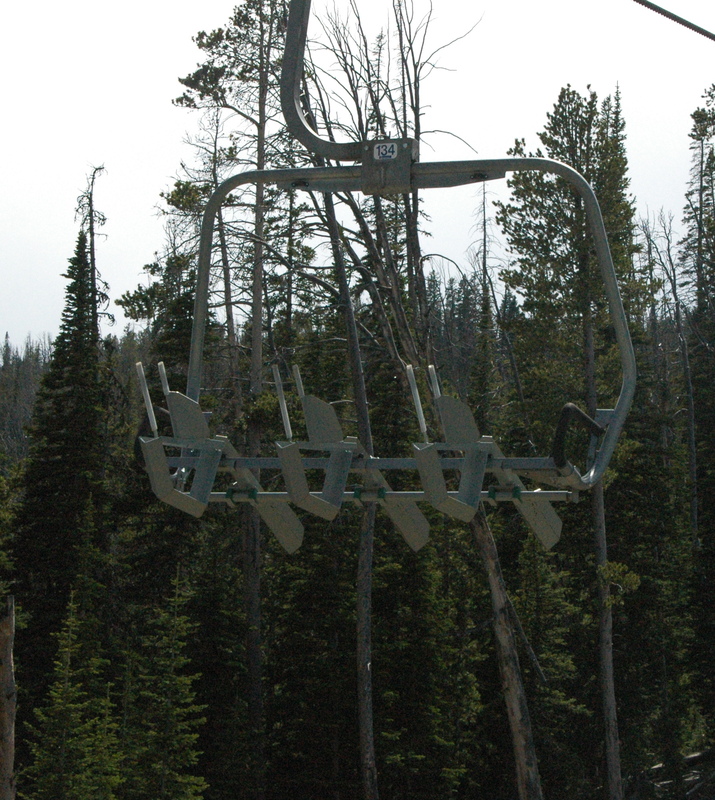 In the summer, the trails open up for hiking and cycling, and they have special lifts to take the bikes to the top. Even though we did not go to the top, it was still a beautiful view of the mountains. 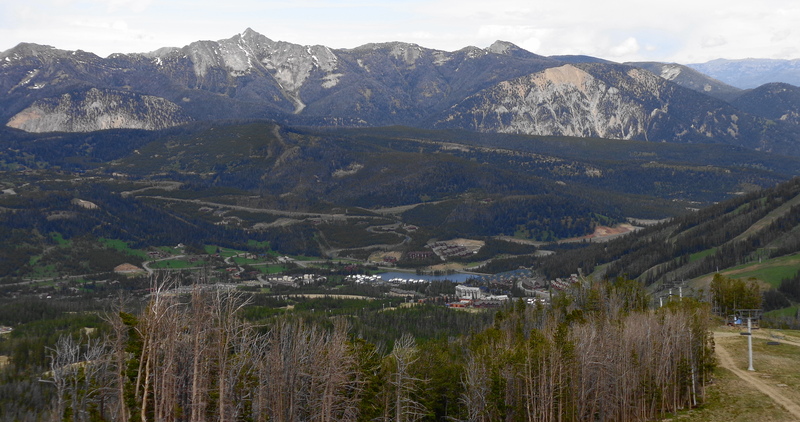 You can see the city of Big Sky down below. A view of the resort area coming down on the chair lift. For those that love skiing, there are many trails for all abilities. After our quick tour, we headed over to 320 Guest Ranch for our complimentary Pig Roast which they have on Mondays in the summer. For $15, you get a pulled pork sandwich, coleslaw, potato salad, beans and a cookie. While the ranch itself is very nice, we were happy that we did not have to pay for the meal. This went into our “glad it was free” category. We enjoyed our time Big Sky. It is a wonderful, and growing city. A day of premature eruptions! 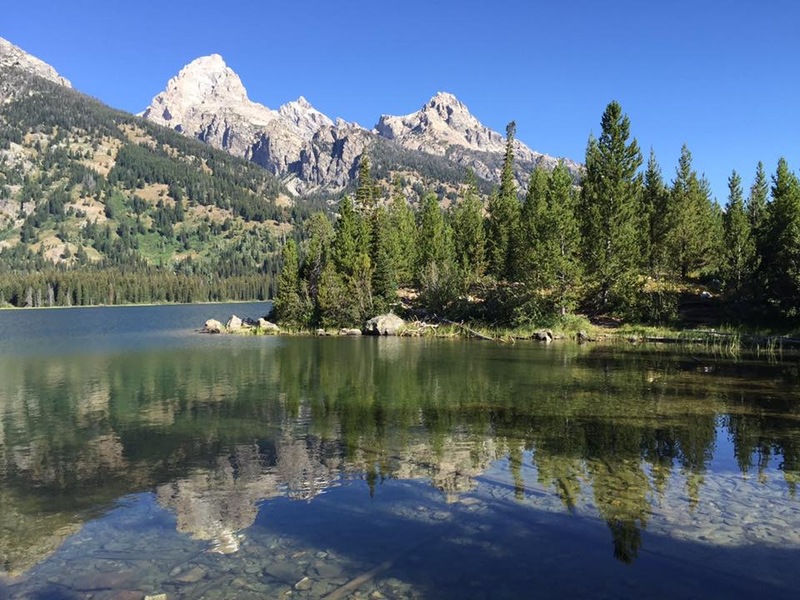 Our friends Karen and Al are working near Grand Teton National Park, and we had planned a get together once the southern road in Yellowstone finally opened up after June 11. With the way the weather has been, picking a date (June 14) so far in advance can be challenging. But we could not have asked for a better day! 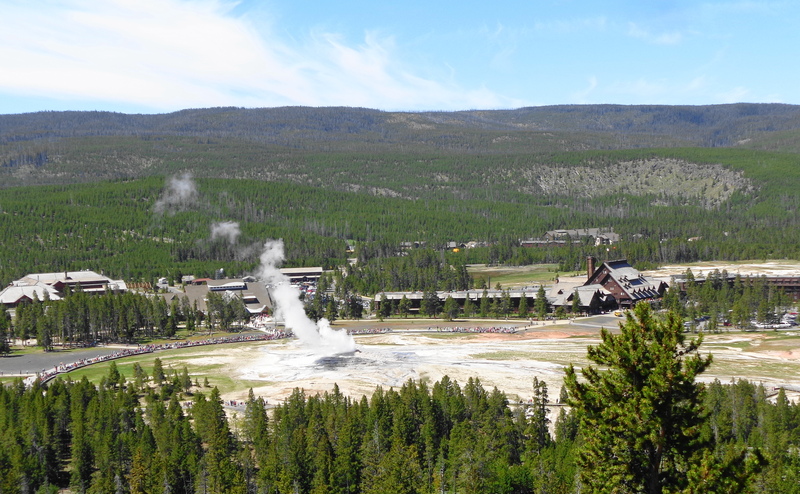 Our plan was to explore the Upper Geyser Basin of the park, which contains the very popular Old Faithful. 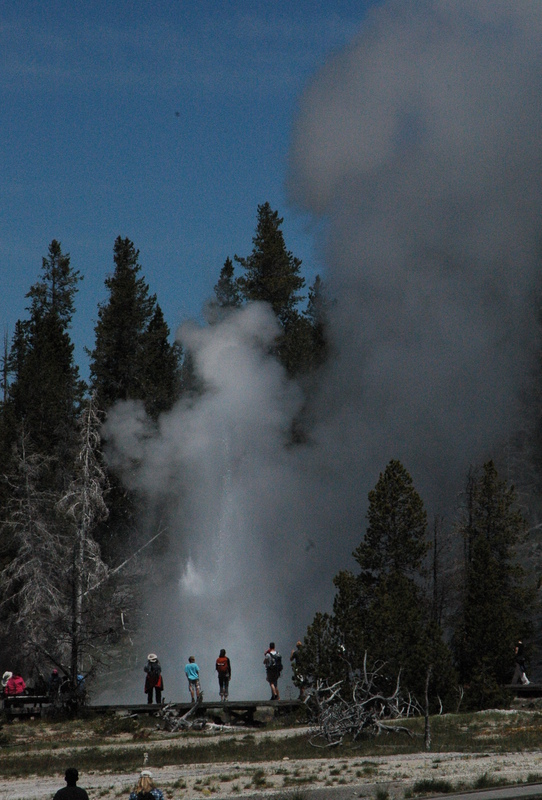 Many people stop to watch Old Faithful, and then go on to explore another area of the park. But they are missing out on a lot of other geysers. 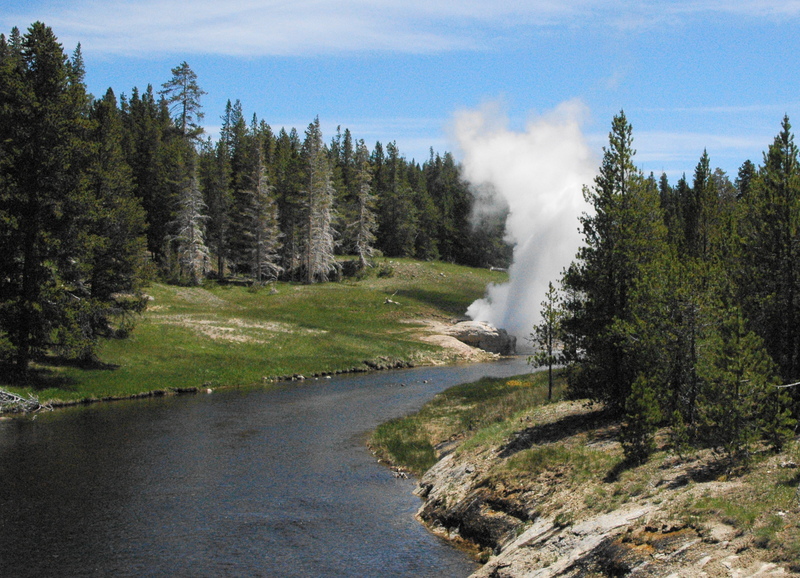 The largest concentration of active geysers in the world are contained in the Upper Geyser Basin. Time for a quick geology lesson! 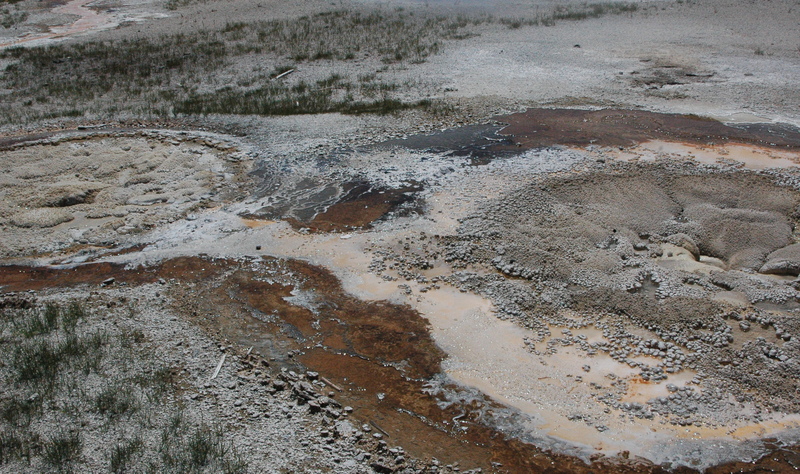 Three major volcanic eruptions have occurred in Yellowstone within the past 2 million years. 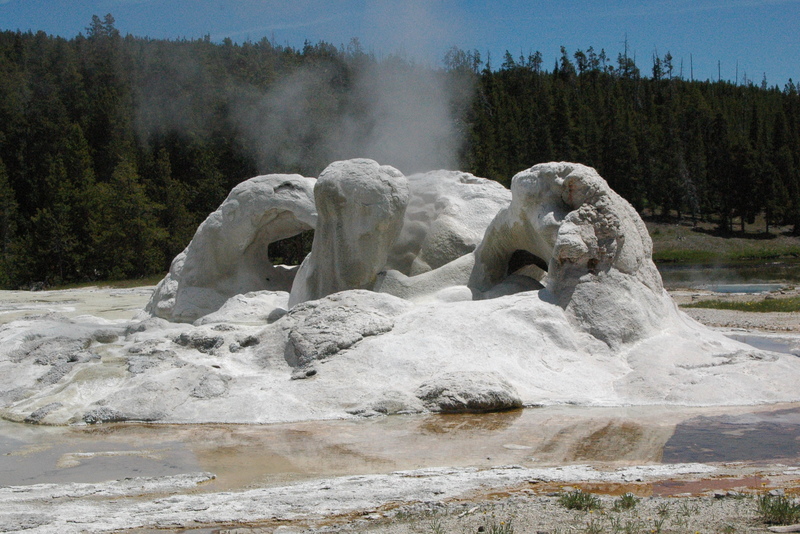 The hydrothermal features in the park include geysers, hot springs, mudpots and fumaroles. Three features are needed to produce these: heat (from the magma 3-8 miles underground the park), water (from the rain and snow), and plumbing (from the natural underground cracks). Today our focus was on the geysers, which are formed when the plumbing/cracks are constricted enough to prevent the water from easily getting to the surface, which would allow heat to escape. The water beneath the surface is under intense pressure, heats up to boiling, and is eventually forced out through an eruption of water and steam. That’s the quick and easy explanation! 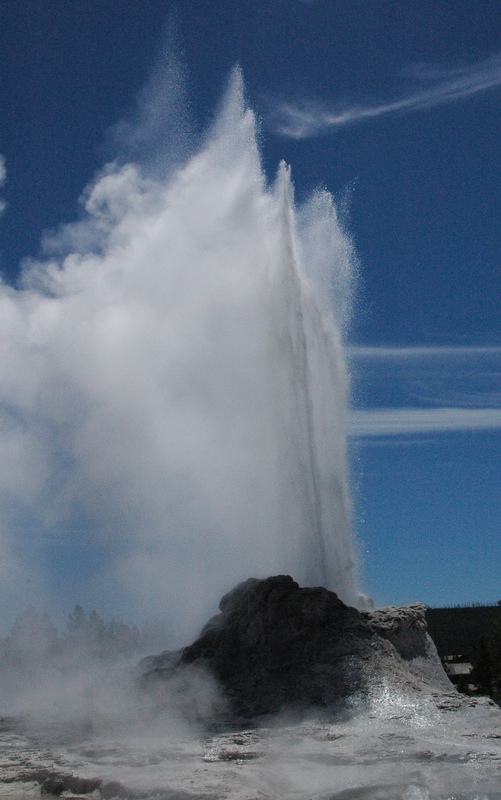 The National Park service now has a Geyser App for your phone, so you can easily monitor when they will be erupting. Of course, cell phone service in the park is very spotty, so you are better off writing down the times that are posted in the visitors center. We arrived early in the morning, in time to watch Old Faithful erupt. In the photo below, take note of the number of people watching. Old Faithful erupts about every 90 minutes, and goes for 1 – 5 minutes, expelling 3700 – 8400 gallons of boiling water depending on the length of the eruption. 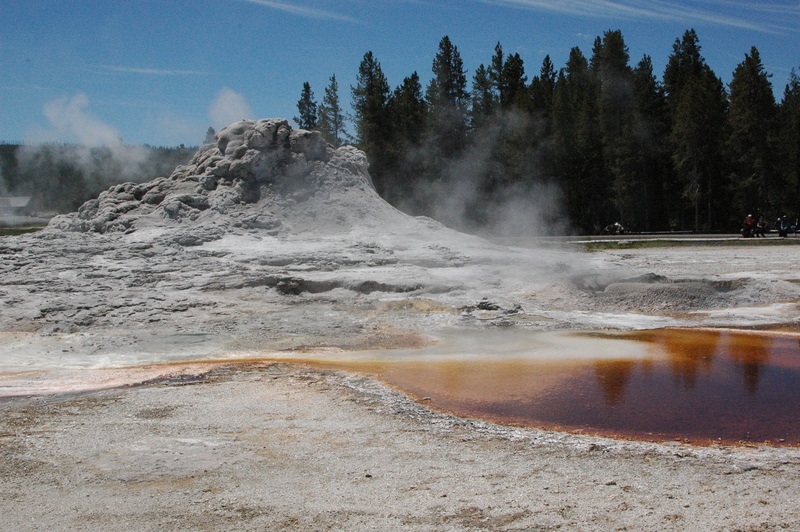 It is the one geyser closest to the visitors center, but it is not the largest geyser in the park. Afterwards, we headed for a quick breakfast, and planned out our day based upon the predicted geyser eruption schedule posted in the visitors center. A side note, we were pleasantly surprised at how affordable food is in the park, compared to West Yellowstone (about 1/2 the cost for breakfast!). After breakfast we took a “brief” hike up to Observation Point. I put that in quotes because the posted sign stated it was only 1/2 mile, but it was almost straight up a hill. From that viewpoint, we were able to watch Old Faithful again erupt,(for the scheduled 11:14am time) and take in the beautiful scenery surrounding the area. In the photo below, you can see Old Faithful on the left, and the famous (and super expensive) Old Faithful Inn on the right. The crowd on the boardwalk is getting a little bigger. We took a short stroll down to Solitary Geyser, which is named because it is far from the other geysers, and no one seems to visit it. 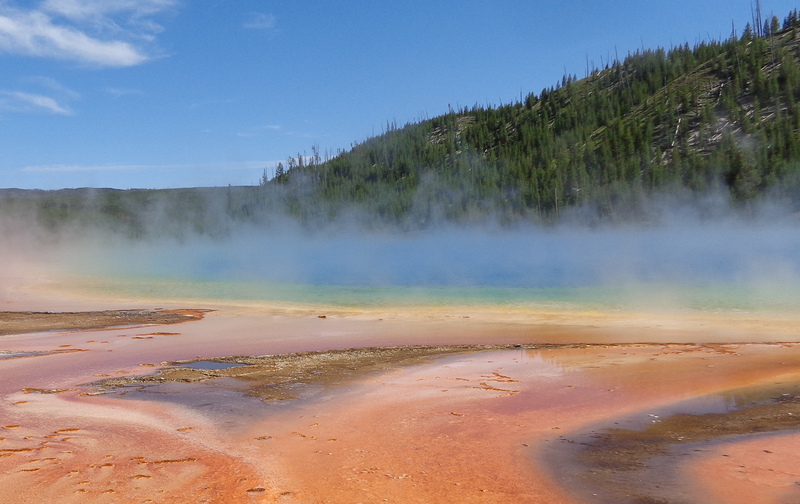 This geyser was altered by humans, before they truly understood what geysers are all about. It was originally a hot spring, and the park put a pipe into it to divert the hot water down into a pool (around 1915). When the water level dropped, the “spring” started erupting. 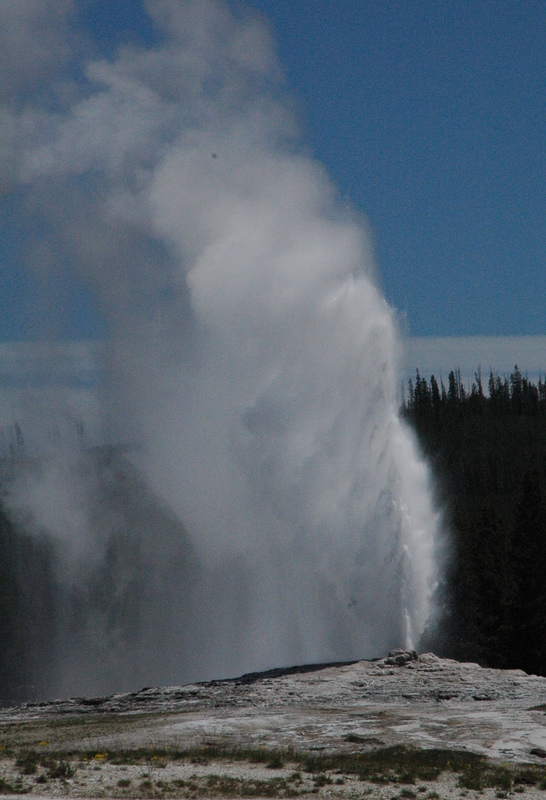 The pipe was removed and the water level restored, but the geyser continues to erupt every 4-7 minutes, to this day. We watched it bubble up and erupt twice while we were there. It goes a few feet in height. Al, Karen and Dan are on the left in the picture below. We had this geyser to ourselves for about 15 minutes before another couple showed up. 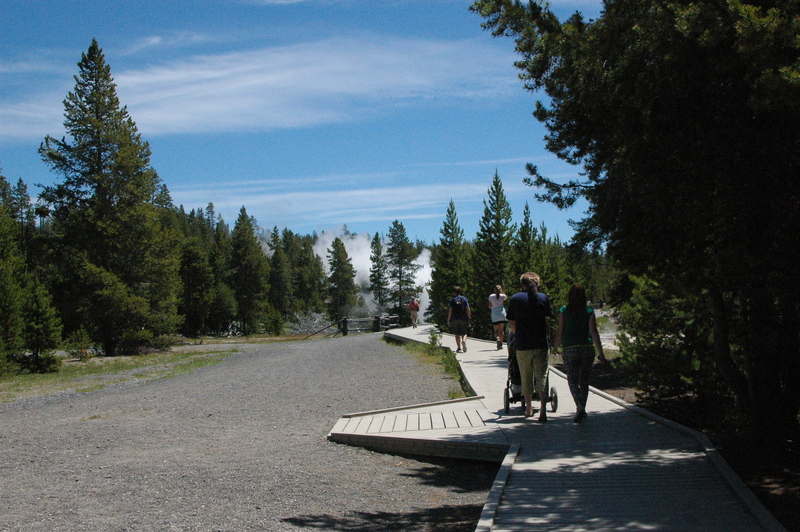 Continuing along the boardwalk, we stopped to look at several small geysers on the way to Castle Geyser, which was set to erupt at 12:25pm (+/- 45 minutes). The park service has a nice trail guide (available for a $1 donation), which has a detailed map and description of all the geysers. We arrived at Castle Geyser a little after noon, and took up a spot to view the eruption. Note the lack of people in the photo in the background. The Castle Geyser only erupts once every 13 hours (+/- 1 hour), and lasts 15-20 minutes for the water phase, followed by 30 minutes of steam. It reaches a height of 75 feet. A little after noon, the smaller pools around the “castle” started boiling, and soon the water started erupting, at first in small bursts, then in one large burst. We were happy we arrived early, since the geyser started erupting early, and it was an amazing display. 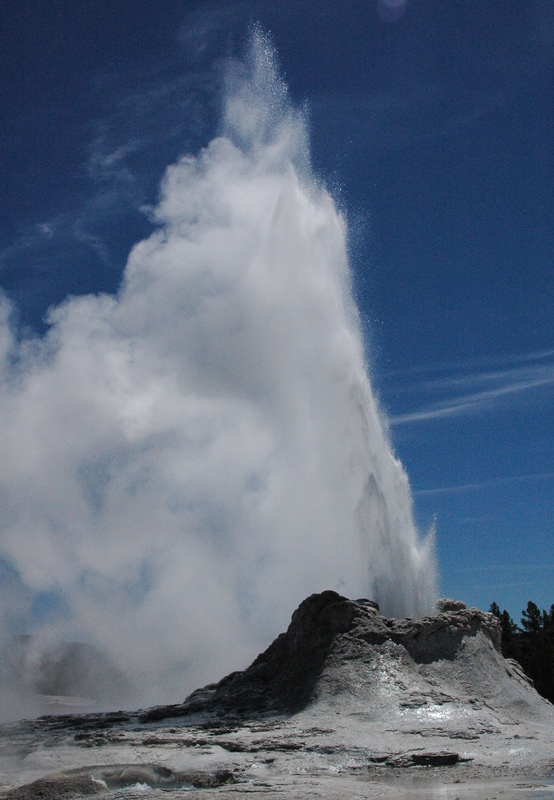 Much more impressive than Old Faithful, even though it does not spew water as high. And to be able to watch a geyser that only erupts every 13 hours was a great experience. We planned on watching the geyser for a while, since the Grand Geyser was not set to erupt until 2:25pm (+/- 75 minutes). 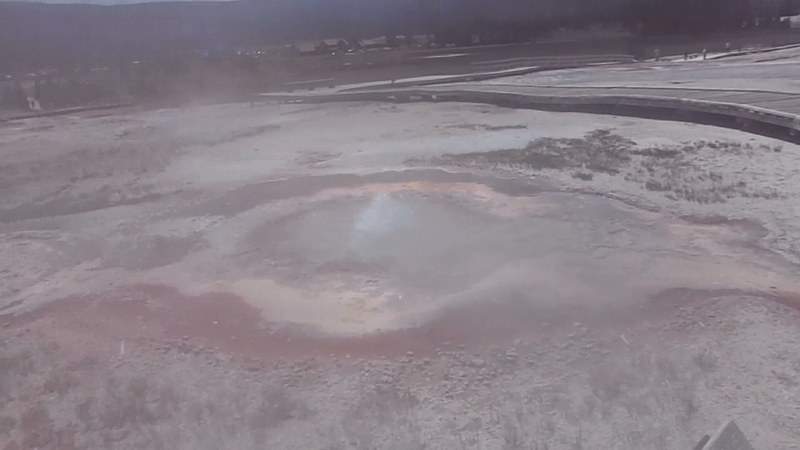 After about 15 minutes of watching the geyser, we started hearing people screaming in the distance. We turned around to discover the Grand Geyser was also erupting way ahead of schedule. Again, there was very few people around the Grand Geyser at the time. The Grand Geyser is considered to be the tallest predictable geyser in the world (just not today!!). Since the duration of the eruption is only 9-12 minutes, we sprinted up the boardwalk to watch the remainder of the eruption. Within the Grand Geyser is also the Vent and Turban Geysers, and they were erupting as well. Vent, on the left and Turban on the right are mostly steam, with Grand in the middle spurting the water. While this was going on, the Castle Geyser had switched over to the steam phase. You can see it in the distance from the Grand Geyser. Unlike the Castle Geyser, when the Grand Geyser ends, it is if someone turned the switch to “off”, because everything just stops. It just looks like a dormant geyser. 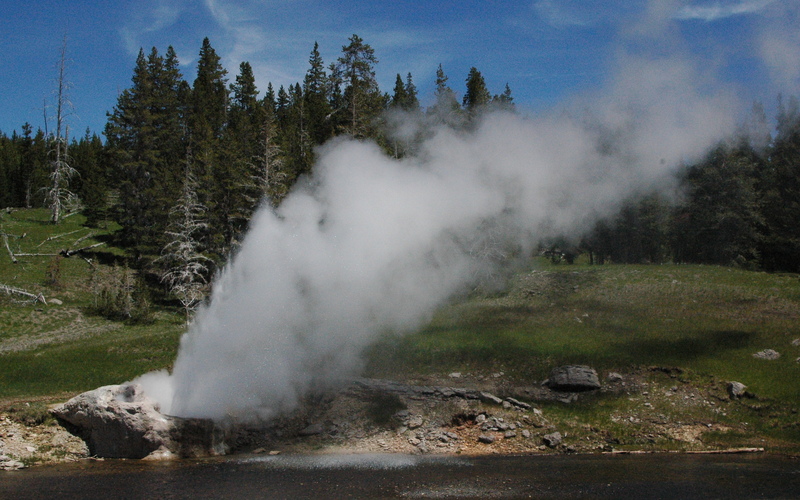 Note how the trees near the geyser have turned white from the steam and water spray. By this time, it was a little after 1:00pm, and the next scheduled eruption was 1:50pm (+/- 30 minutes) at the Riverside Geyser. Thinking we had plenty of time, although aware that everything else had gone of prematurely, we headed down to see the very popular Morning Glory Pool. We passed the Grotto Geyser on the way, which has no predictable schedule. It is very unique in its shape. The Morning Glory Pool was named after its likeness to the flower. The pool is a hot spring, not a geyser. People have thrown coins and other objects into the pool over the years, which have clogged up the steam vent. As a result of this vandalism, the temperature in the pool has been lowered, and more bacteria has grown. The park service has tried to lower the water level and vacuum out many of the objects, in order to restore the pool back to its natural state. And yes, while viewing the pool, we again heard more screams in the distance, and turned around to discover the Riverside Geyser was also erupting early! 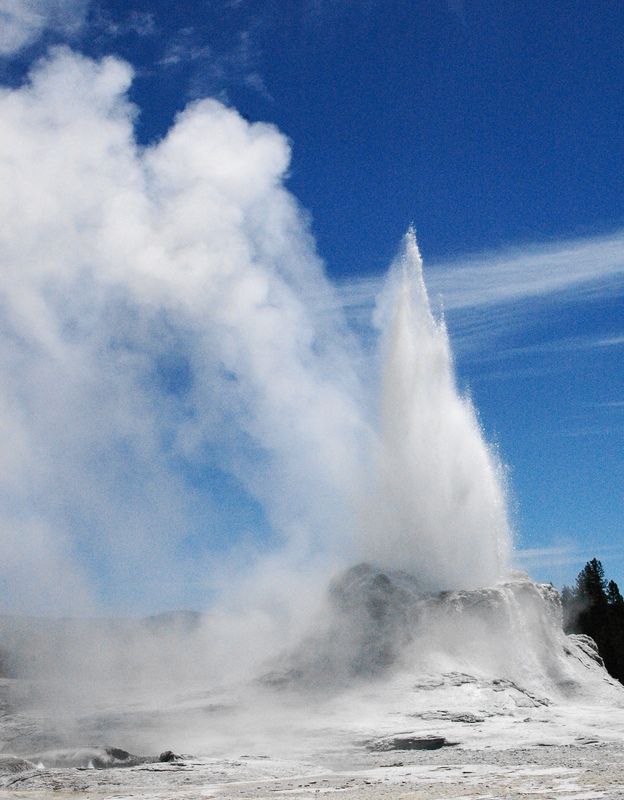 The Riverside Geyser erupts every 6 hours, and lasts about 20 minutes. 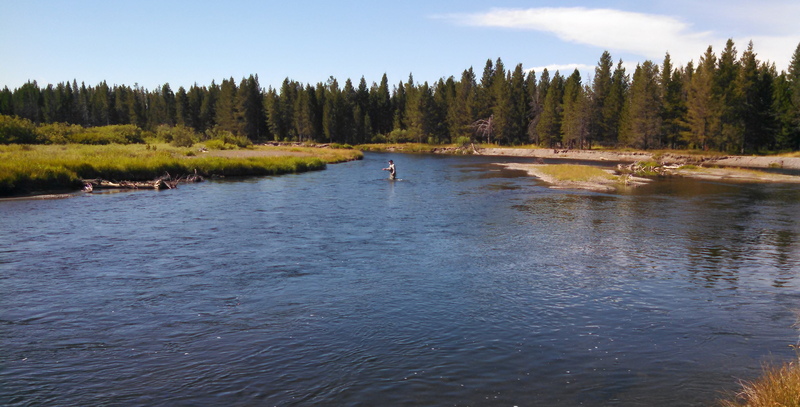 It is on the bank of the Firehole River, providing a very scenic display. We sat and watched the geyser for about 10 minutes, before making the almost 3 mile walk back towards the visitors center. 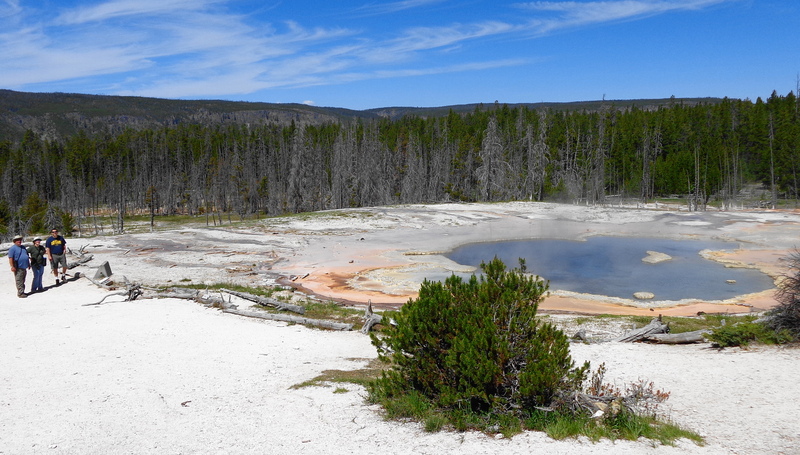 We stopped along the boardwalk to view a few more geysers, and stopped to watch the Anemone Geyser. The geyser is actually two geysers close together, and are named after the Anemone flower. 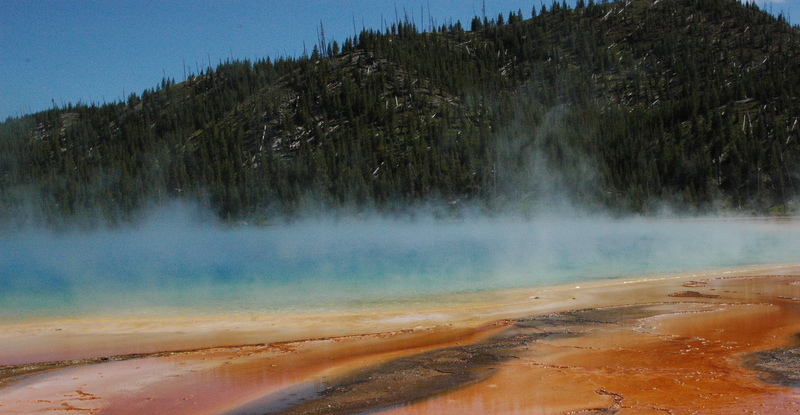 Most people just walk right on by, not realizing these little geysers erupt every 7-10 minutes. 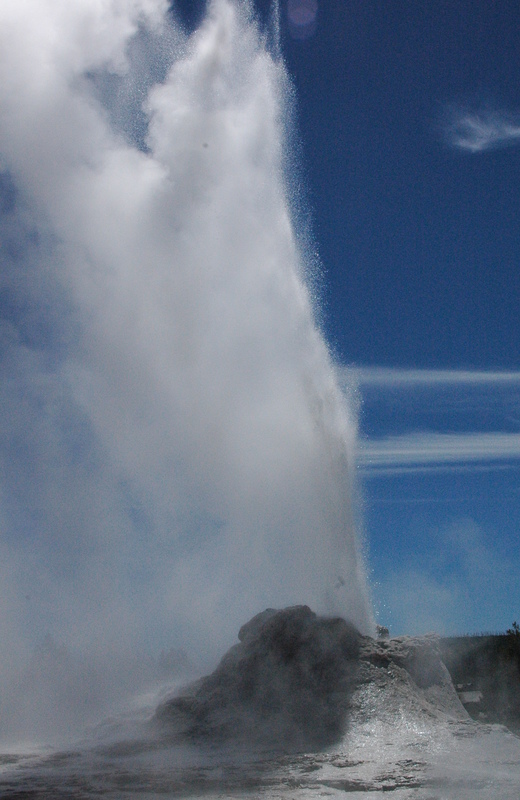 It is worth the wait, because you could get splashed by this geyser, depending on which way the wind is blowing. We ended up with a splash of water and steam. After a reasonably priced, and tasty meal at the Old Faithful cafeteria, we headed over to the Midway Geyser Basin to try to view the Grand Prismatic. 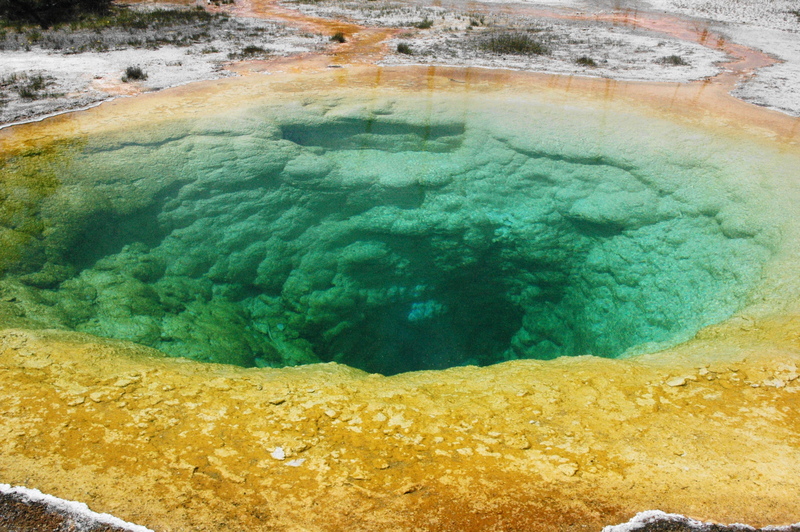 At 370 feet in diameter, it is the largest hot spring in the park. It is also difficult to see, due to the constant steam (blue colored) floating up from the spring. To get a good view, click here, for some google photos. Some folks do go “off trail” and hike up the hill you see in the background of my photos. According to Al’s fitness app on his phone, we walked over 12 miles in about 8 hours. It was a wonderful day with good friends, and spectacular eruptions. 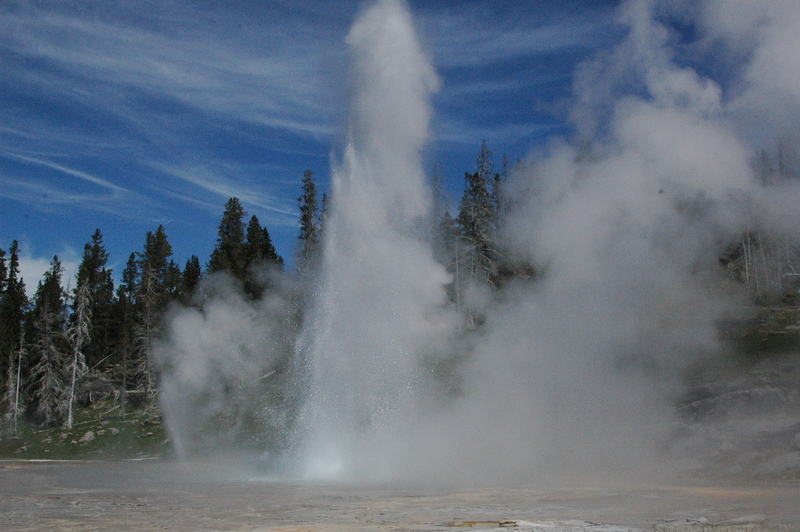 We feel very fortunate to have been able to view so many geysers erupting in one day. If you have the time, don’t just watch Old Faithful and leave. Go take a walk around the entire Upper Geyser basin, and look at all the wonderful thermal features. Perhaps if people realized this is the only place on Earth to see so many, they would spend more time here. 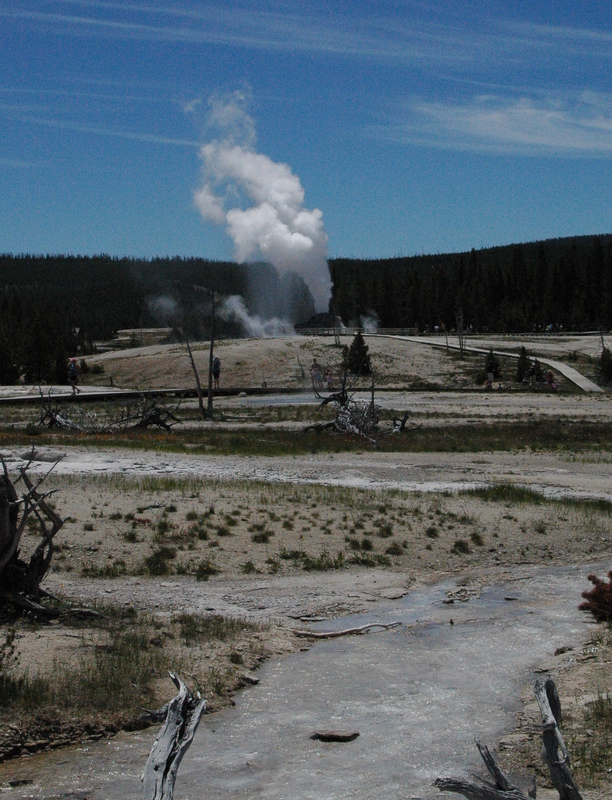 Oh, remember my first photo of Old Faithful (yes, I know this is a long blog) showing a few hundred visitors? This is what you will encounter when you go in the afternoon (taken when we were leaving the area). Thousands of people crammed together! Go early!! How do you start a horse?! One of the perks with some work camping jobs is free passes to local attractions. Last summer, we were fortunate to receive VIP passes for working in the Black Hills, and were able to see and do many activities, free of charge. This summer, we did not think we would have that opportunity, but happily, we were wrong! If you are considering work camping jobs, asking if there are any free perks/passes is a good idea. 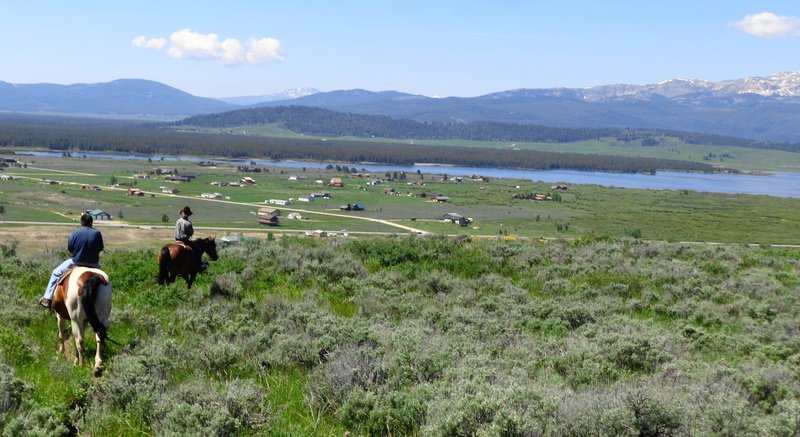 The Big Sky and West Yellowstone Chambers of Commerce have created Host Week passes. These are passes to many local attractions and restaurants that offer free or reduced prices. The only caveat is that it only valid for 10 days in June. So we did our best to cram as much as we could on our off days. As such, I will have several blog posts of our activities over the next several weeks. Work itself is slowly picking up. Most schools should be out by now, so bring on the tourists!! I can only dust the same items at work so many times! 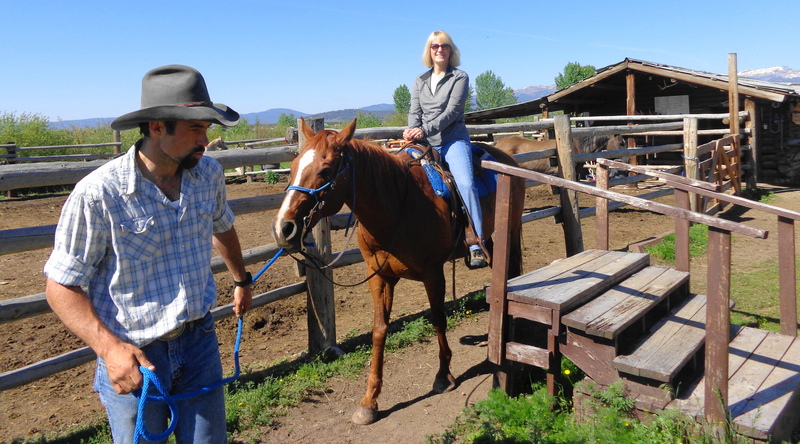 One of our first “free” attractions that we visited was a horse ride courtesy of Parade Rest Guest Ranch. 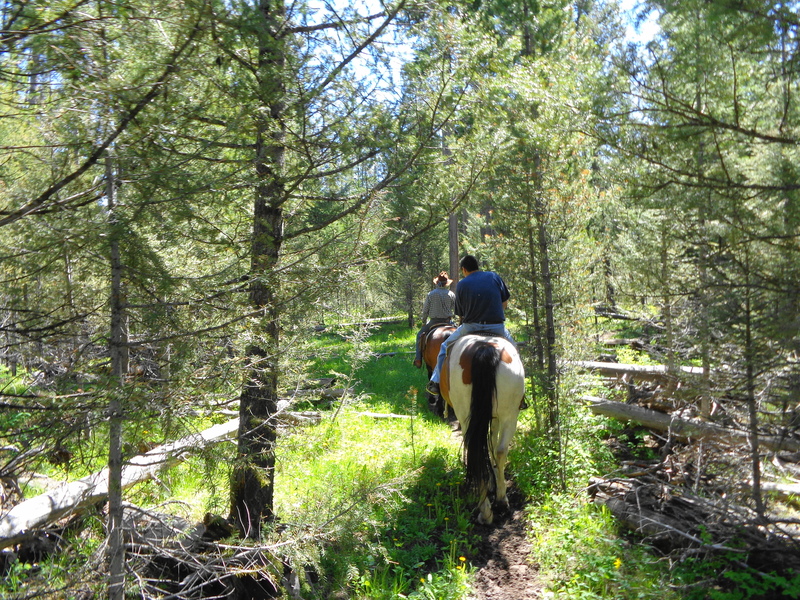 A one hour ride through the Custer Gallatin National Forest is normally $55.00 per person. Since we booked so early in the season, Dan and I were the only two people during our ride with Tristan, our guide, which made for a more personalized experience. They make it easy for beginners, as you mount the horse from stairs. My horse was named Buck, and Dan’s was on Rowdy. When we started our ride, Dan and our guide took off, and I just sat there. I was a bit puzzled on how to get the horse moving! 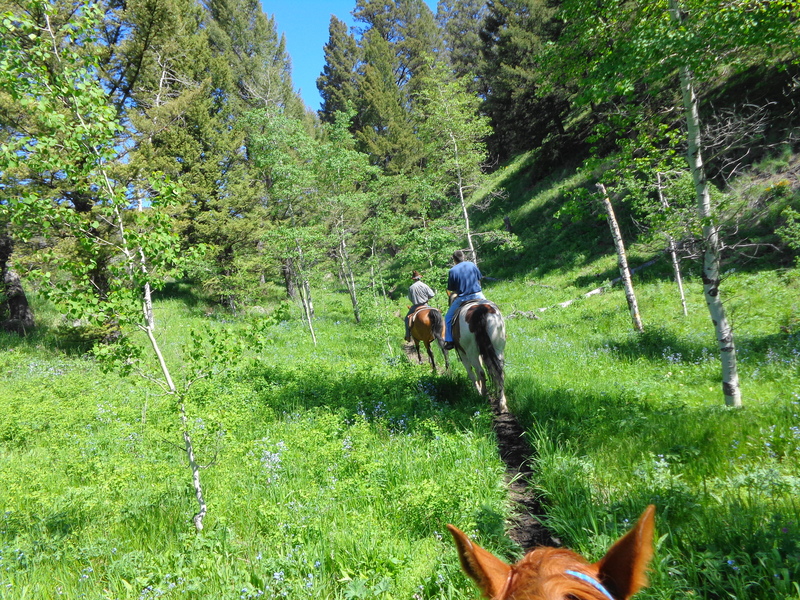 Our guide gave us a lot of safety instruction, and how to steer the horse, but not how to “start” it. Tristan quickly noticed I was not moving, and told me to kick Buck. I don’t want to kick an animal, so I gave Buck a gentle tap….and he did not budge! Then Tristan yelled “kick, kick, kick, kick, kick!” So I followed his instructions and kicked and kicked. And off Buck went, a bit too fast for my liking! I quickly realized that saddles have no padding. If they can make bicycle shorts, I wonder if they have saddle pants?! Buck quickly settled down, and probably realized I was an easy target, as he frequently stopped for a mouthful of grass. We kept a leisurely pace well behind Tristan and Dan. 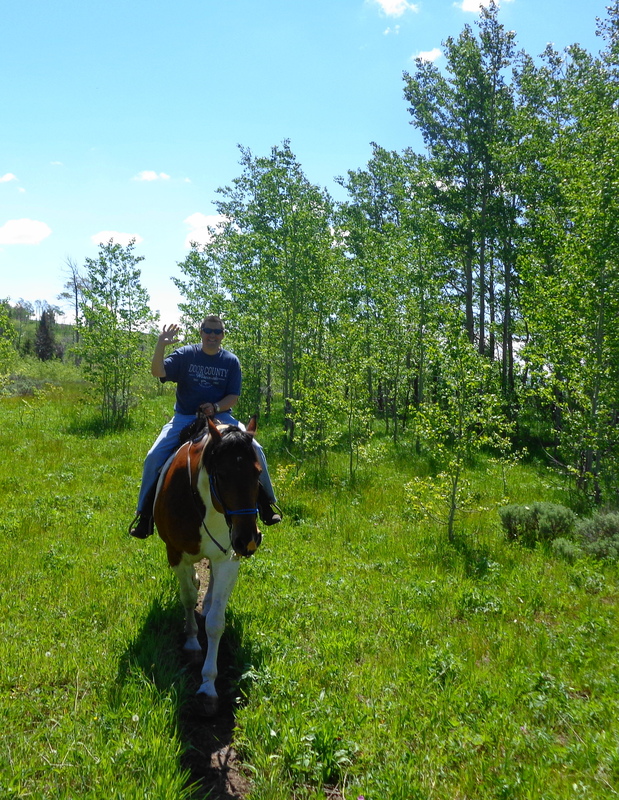 Our ride started out in prairie grass, but quickly climbed up through the forest. 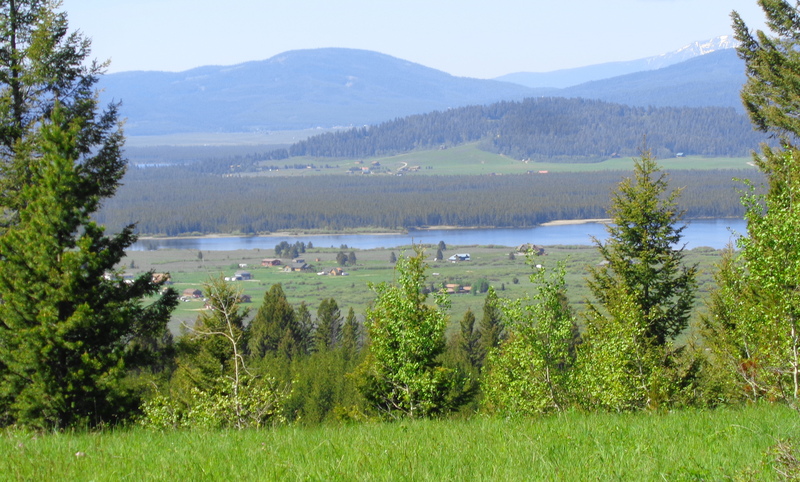 After about 20 minutes, we came to a scenic overlook, where we could view Hebgen Lake down below, with the mountains in the background. It was a beautiful and peaceful view. Dan and Rowdy seemed to get along nicely. He was a pretty big horse. I think our guide said he is a Quarterhorse. Buck just continued snacking along the route. I tried to pull up when he put his head down, but he was stronger than I was. The views throughout our ride were beautiful! As we started to descend back down the hill, we had an overview of the barn and corral at the Ranch. 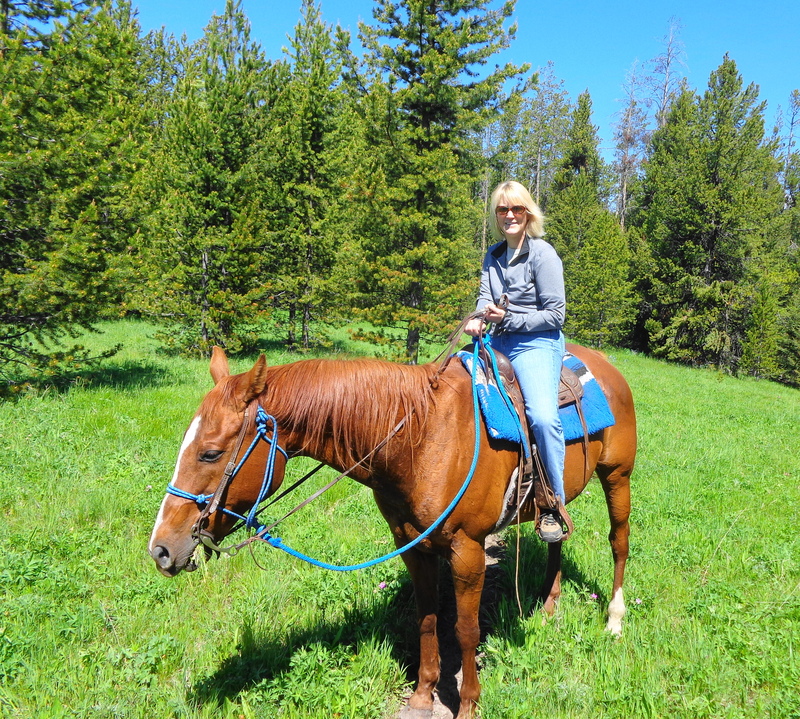 We had a great time on our ride, and would definitely recommend the Parade Rest Guest Ranch for anyone interested in a horse ride in West Yellowstone. 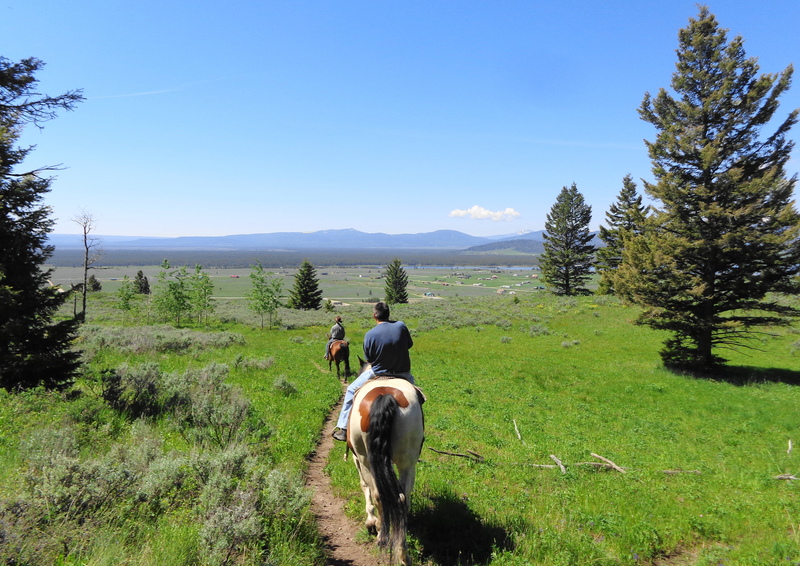 There are several companies that offer rides, but given that this ranch has a special use permit to ride in the forest, made for a challenging (up and down narrow trails), fun and scenic ride. 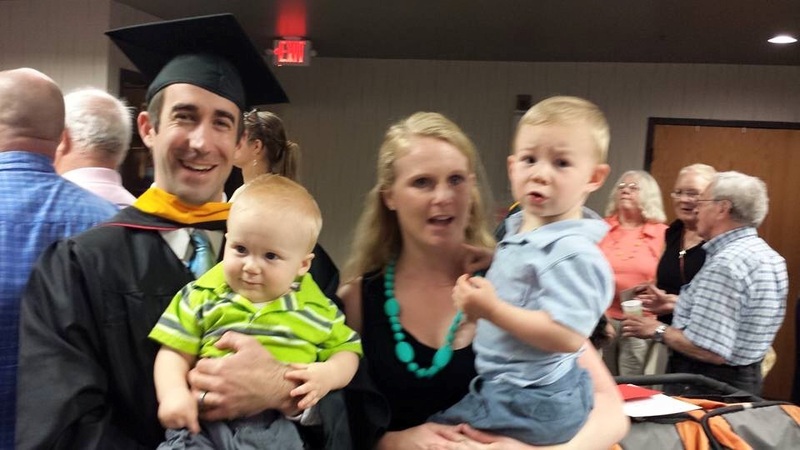 Dan and I also want to give a special shout-out to my nephew Jeremy, for graduating from a very challenging Nurse Anesthetics program in Minnesota. 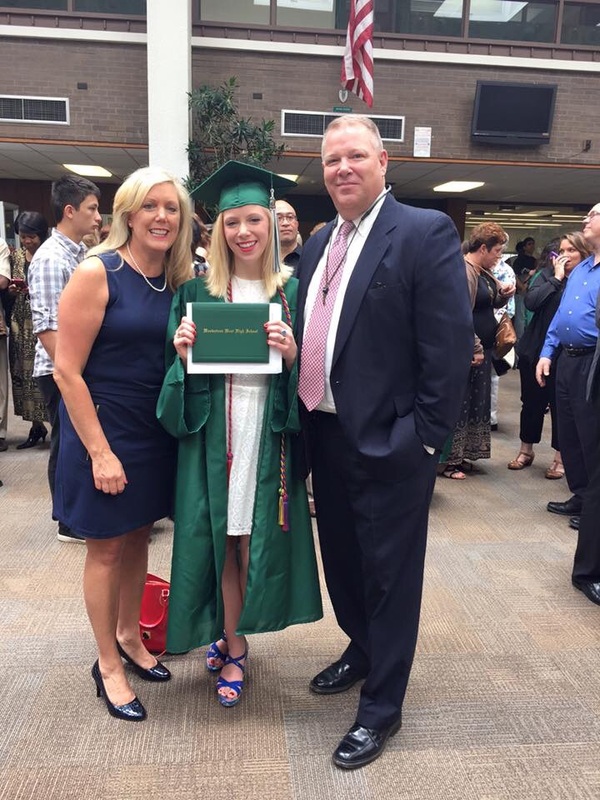 Also, congratulations to my niece Molly, for graduating from High School! One of the few downsides of this lifestyle is that you are going to miss some special occasions. So hugs and high fives from Montana! !